Do you find yourself frustrated because your data dashboard is not resonating with key business stakeholders? Don’t fret — you’re not alone. Many dashboard architects feel this way day in and day out. 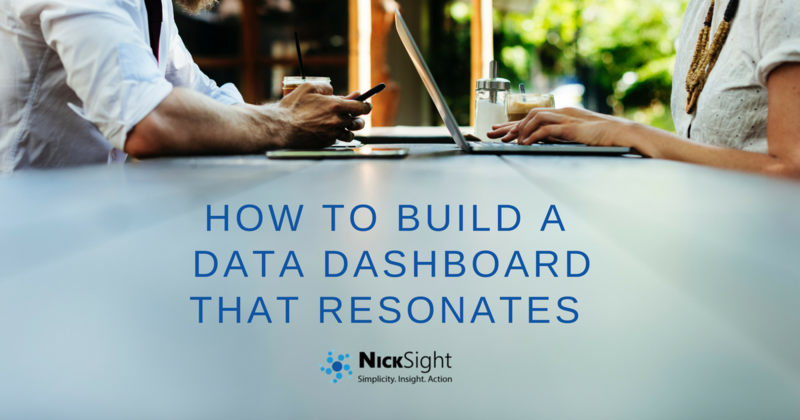 In this post, you’ll be given tips to help close that gap between a highly functional data dashboard and one that makes it clear to your audience what action to take from it. You’re juggling a lot — between mitigating for data quality issues and building reports to trying to understand why data dashboard users are either asking so many questions or not enough. It’s wearing and, at the very least, can make you feel like your data dashboard is missing the mark. If you find yourself here more often than not, it’s time to take a different approach to your building process. A leading reason where many processes are broken is that there is a disconnect between you — the data dashboard architect — and the end-user. Many times the end-user presents issues that could have been totally avoided if they were engaged with before the data dashboard was built. Include any and all data dashboard users early in the journey of creating the dashboard. Doing so has proven to eliminate frustrating risks altogether, yet it’s overlooked by so many. You can easily avoid these and many other unnecessary risks such as changing goals and objectives, which cause the data architect to have to restructure the entire build — if the end-user is engaged with early and often throughout the building process. And while not all user input will be integrated into a final data dashboard, most of the value comes from the interaction between the architect and the end-user by simply fostering a human-to-human relationship. The relationship you build with the end-user is a relationship to craft carefully. If done well, over time the end-user or users can shift from being a critic to an advocate and even a champion of your work. It’s no doubt a tough cycle to break and it certainly requires you to take a step back to objectively look at your build process from the beginning to the end, but once it’s done, you’ll see a favorable return not to mention less work for you in the long run. This leads to the user asking handfuls of questions when they actually see the dashboard, which results in frustration for both you and the user and a lot of tangential back and forth. Overall, not a great experience for anyone involved. Look at this from a customer service or experience perceptive. Say, for example, you’re under contract with a home builder who is working to build you and your family a brand new home.What if the builders only involved you in the process when they were handing you over the keys or when it’s time to conduct an inspection? You walk into your new home with a set of expectations of what it should look like and none of those needs were met, resulting in unmet expectations. You’d be very upset and tell everyone in your life about their less than impressive work. The builders would need to then have to go back to the drawing board to meet the buyer’s needs.The same is true for dashboard building. Communication with users throughout the process is the secret sauce to having a well-built dashboard that functions and meets the needs of the end-user. Like in any relationship, trust is the cornerstone of its longevity. For business relationships, the emphasis on trust is perhaps a bit more important due to the fact that the user is entrusting you, the dashboard architect, to help them meet their goals and grow their career. If this trust is lost, it’s nearly impossible to rebuild and to earn back. Having an open line of communication coupled with honest level-setting conversations can keep the trust between the two of you healthy. Do everything in your power to keep end-user trust protected throughout the process. Avoid any and all instances where that trust could be at risk. Let’s go back to our home building example. The unsatisfied home buyers are so unhappy they go directly to the builder’s boss and the company’s upper management. The buyers call the builders out by name and list in detail what went awry. Any good standing and potential pay raise or promotion the builders were poised for is now at risk.Again, the same is true for you as the data architect. If the user feels so compelled by a dashboard that doesn’t meet their needs, your boss is likely to hear about it from the user directly, which should go without saying — reflects poorly on you. Not only would any potential promotion fall the wayside, but your work could potentially be viewed differently and respect for it would be tarnished. Dashboards fail to resonate with users because their questions and needs are not being answered or met. Without talking to them often it can be difficult to know what those needs are. Improve and iterate on your building process by mapping their questions to your charts and continuously refine the visuals to the company’s objectives. At the end of the day, an end-user will find it less cumbersome if you ask clarifying questions throughout the process than after the data dashboard is released. This is the process used with the Global Fortune 100 on actual real-world analytics engagements. It ensures alignment with stakeholders, user and the business that produces actionable insight and bahavioral change. 0 responses on "How to Build a Dashboard That Resonates"